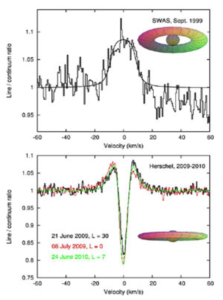 While observing Saturn’s water with Herschel in June 2009 with the goal of determining its origin, the HssO Team detected a cold water vapor torus orbiting around Saturn. This torus was absorbing Saturn’s emission because of a favorable observation geometry. It was Saturn’s equinox and Herschel was crossing Saturn’s ring plane. The analysis of the data shows that the torus is located at the orbital distance of Enceladus, one of Saturn’s small icy moons. Observations of water in Saturn with SWAS in 1999 (top) and Herschel in 2009 (bottom). The observation geometry of Saturn and the Enceladus water torus is also displayed. Taken from Hartogh et al. (2011). 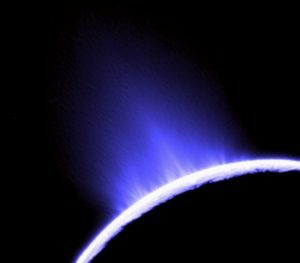 Interestingly, and a few years back, the Cassini mission had detected water geysers at the South Pole of Enceladus (Porco et al. 2006, Hansen et al. 2006, Waite et al. 2006). Cassidy and Johnson (2010) predict that a significant fraction of this water eventually rains into Saturn’s atmosphere. Additional observations of Saturn are required to assess whether this model is correct. Reference: Hartogh et al. 2011, Astronomy and Astrophysics 532, L2. 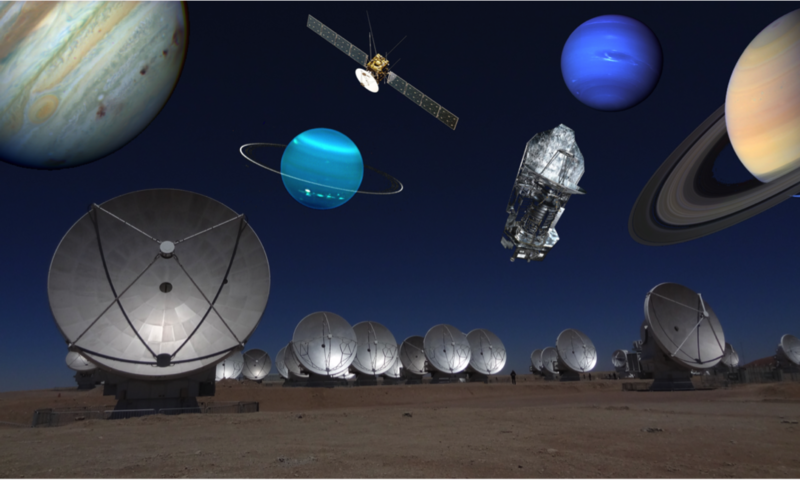 ESA press releases: click here for a short version, or here for a detailed version.